A video has surfaced from June 25th, 2018 which appears to show a “large flying creature” captured on home security camera in Rantoul, Illinois. Large flying creature caught on home security camera at 2:19 a.m. June 25, 2018. This was recorded in Rantoul, Illinois. A large creature or object can be seen flying across the screen and in front of an exterior light at about the 00.04 mark, but details are otherwise scant. The Singular Fortean Society commented on the video to request further information from the witness who posted it. 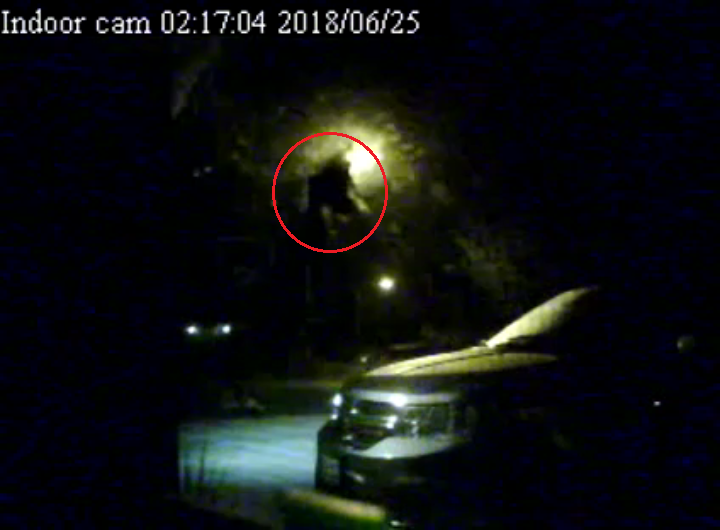 In response, the witness confirmed that the streetlight behind the ‘creature’ is approximately 65 feet from their garage. "The camera is sitting inside of the house pointed toward [the] driveway in front of [my] garage," the witness said. "It is a very normal streetlight." Emily Wayland, the Singular Fortean Society’s photo and video expert, thought that the ‘creature’ was likely between the streetlight and the vehicle. The flying object can be seen blocking the light, but appears to have a negligible effect on the illumination of the vehicle. The lighting does change as it passes in front of the streetlight, but only minimally; lens flare disappears from one frame to the next, and the illumination of the car’s hood and windshield dims slightly. The camera has caught nothing else unusual to date. "Nothing before or after," the witness said. "I check everyday." The village of Rantoul is about 120 miles south/southwest of the cities of Chicago, Illinois and Gary, Indiana; both of which have seen a flurry of flying humanoid sightings in recent years. This is the latest news in a string of ‘Mothman’ sightings from within a few hundred mile radius surrounding Lake Michigan, including every state bordering the great lake. These sightings ostensibly began in the spring of 2017, but more historical accounts are being reported as more people become aware of the phenomenon. They generally take place in the evening or at night, often in or near a park, and around water. Witnesses consistently describe a large, gray-or-black bat or bird-like creature—although in a small number of cases the creature was described as insect-like—sometimes with glowing or reflective red, yellow, or orange eyes; and humanoid features such as arms and legs are often reported. Many of the sightings are also of something seen only briefly or are described only as a flying creature with few details, which leaves open the possibility that a large bird or bird-like being could explain some encounters.